Apparently, some people actually spend time at the vendor expo at tech conferences. I was too busy binge-watching sessions to take a breath and visit the booth babes, but I left the Microsoft Ignite conference with a very clear vision of the future of SharePoint. 5. Microsoft wants you to think twice about complicated branding and other customizations. 4. Automated Site Provisioning is now possible with the new provisioning engine from the PNP team. 3. The Office Graph is the next big API that you need to know, and Delve is just the beginning. 2. 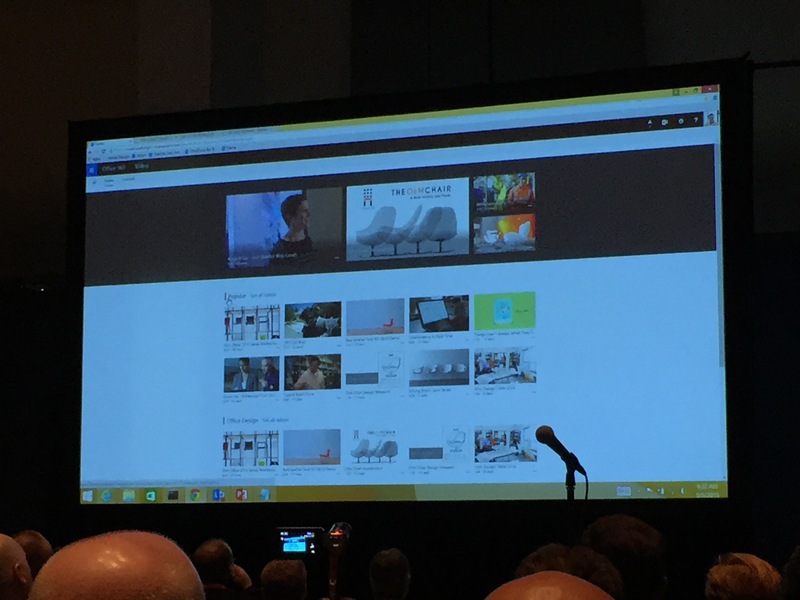 Responsive design is coming to SharePoint Online in the form of Next-Gen portals. 1. Microsoft is innovating in the cloud FIRST. 5. Microsoft wants you to think twice about branding Office 365 and other complicated customizations. It’s never actually that simple, and if you’re in the consulting world like I am, it’s rarely even close. The reason for not recommending using a custom master page is because Microsoft is rapidly innovating in SharePoint Online. This means that the very second you duplicate “Seattle.master” for your custom page, it’s already out-of-date. Microsoft understands that custom brands are important to its customers, but wants you to recognize that there is a cost to deep customization, just like there is with any other platform, and that cost is the potential that updates break your solution or your solution won’t support new functionality when it rolls out. If you think about it, this has always been the case– but we used to have to wait months or years between update cycles. With the cloud release cycle clock interval now ticking in mere days, your customizations get stale quickly. 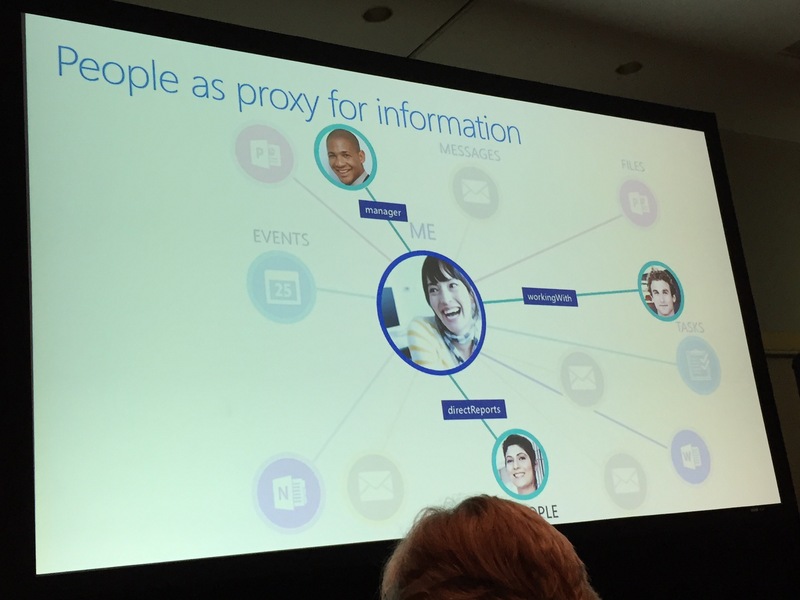 There are OOB ways to brand Office 365 that might be good enough. You can use an Office 365 Theme with Microsoft’s theme builder app, which allows you to customize the color of the Office 365 navigation bar and other main color scheme elements. Consider the cost of developing a custom brand vs. the value you get from it. If you think that there is enough value in your custom branding to forego new releases and risk an update breaking your branding, you are free to use a custom master page at your own risk. It is supported, just not recommended. Global Navigaion isn’t as necessary as you think it is. 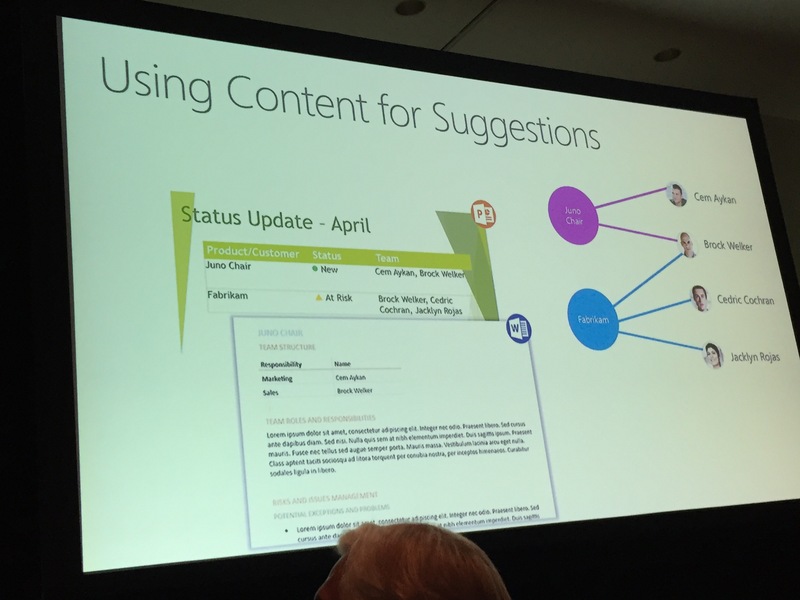 Configuring Promoted Sites for different intranet audiences may get you most of the way towards getting users to relevant content faster; consider setting Delve as the default home page for Office 365 so that users don’t have to navigate to content. All of this is well and good unless you want to build a portal site, and Microsoft recognizes that it doesn’t provide solutions for a true company-wide intranet portal in Office 365. This forces us to create super-custom master pages that not only take time and money to develop, but run the risk of breaking when Microsoft changes something in the Matrix. But fear not: they’re working on bringing us Next-Gen portals, and they look awesome. More on that later. 4. Automated Site Provisioning is now possible with the new Provisioning Engine from the Office 365 Patterns and Practices (PNP) dev team. My company’s biggest hurdle in the way of moving us to the cloud is that we invested a lot of time and code in building custom site templates in farm solutions. We even overrode the SPWebProvisioningProvider class for complete, synchronous control over the feature activation process during provisioning. Up until recently, none of that was possible in Office 365, but it is quickly becoming a reality. Enter the PNP team. These guys are churning out code like mad over in the Office 365 PNP Git repository (did I mention it was open-source!? ), and I got to talk with Erwin Van Hunen (O365 MVP, @erwinvanhunen) about the future of what the PNP team is calling the cloud provisioning framework for Office 365. What is the cloud provisioning framework? It’s the answer to custom site templates in Office 365, and interestingly enough, the concept is very similar to writing a custom SPWebProvisioningProvider class. Admins can use the provisioning framework to (1) create an instance of an OOB template (e.g. Team Site), then (2) run a set of customization commands to create SharePoint objects like site content types and fields, lists, even custom term sets. Erwin’s demo showed an XML file that looked similar (but not identical) to traditional feature elements. Provisioning is accomplished by feeding this XML file to the provisioning engine via PowerShell commands; the engine parses the XML and calls the client-side API to provision the various objects. Even cooler yet, the engine has its own API that you can call via your own PowerShell commandlet or Provider-hosted app (in lieu of using an XML file), and it supports exporting some components of an existing site. I’m going to dive into this one soon, so I’ll post an update once I get my hands on it. If you’re like me and hadn’t checked out Delve yet, it’s time. At Build the previous week and again at Ignite, Microsoft made no secret of their belief that machine learning is the next big thing. They call this Office 365-specific machine learning the “Office Graph”, and recently released Delve as the first major application built upon it. The Office Graph will learn to intelligently suggest people and content based on your interactions with both. Microsoft is counting on the number-crunching, relationship-inferring Office Graph to entice stuck-in-the-mud IT professionals to move at least part of their SharePoint farms to the cloud. The nature of machine learning is that it’s only possible in the cloud because of the massive processing power it requires– and although Microsoft intends to allow the Office Graph to index your on-prem SharePoint 2013 farm via an update later this year, Delve and the Office Graph API will still only be available in the cloud (so you’ll need a hybrid environment at minimum to use it). New “Boards” in Delve aggregate documents around tags. Delve replaces the old User Profile page in Office 365. 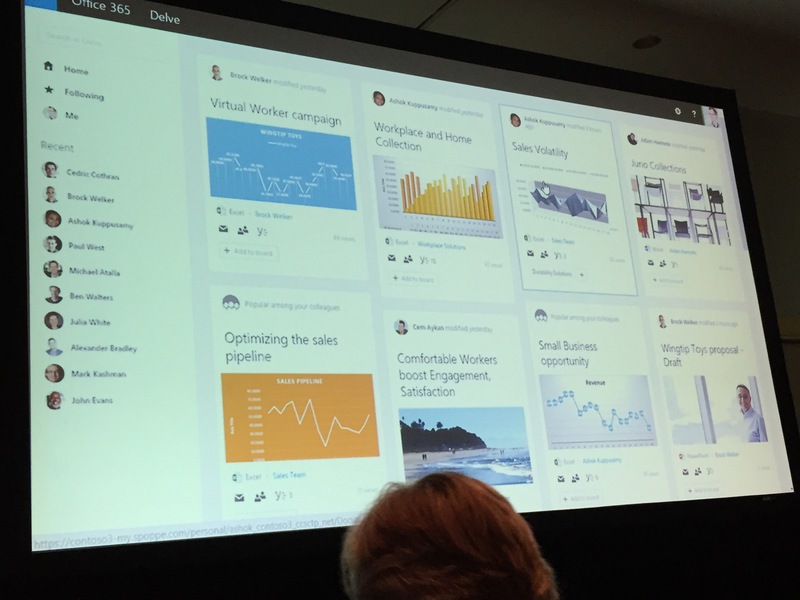 So go check out Delve– it’s built on the Office Graph, its purpose is to allow users to “find content via interactions with people, and find the right people through interacting with content”– and it replaces the old User Profile page in Office 365. Oh, and did I mention that it boasts a completely responsive design AND native client apps for iOS and Android? The Microsoft gods heard our prayers, or at least the product team did. And what a response! (Get it?) 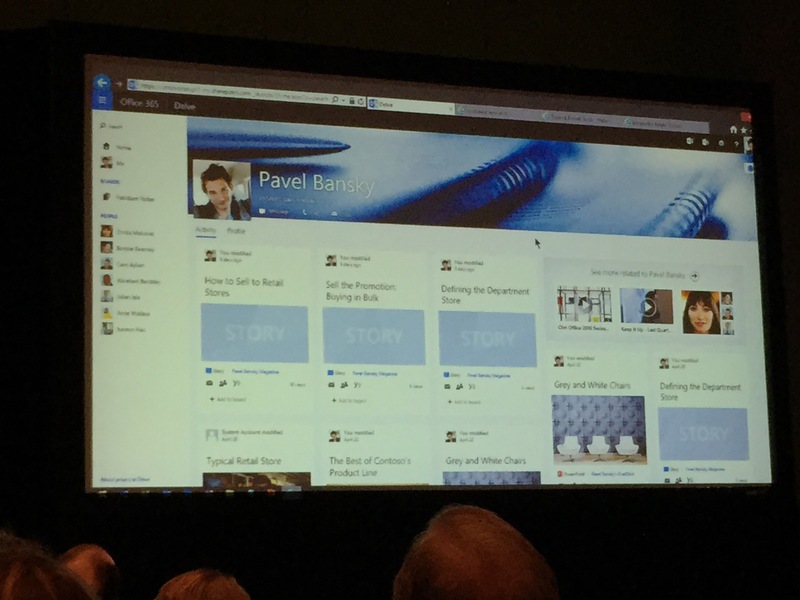 In multiple sessions previewing the “next-gen portals”, Microsoft introduced 3 new concepts for curated content on SharePoint with beautiful responsive design. 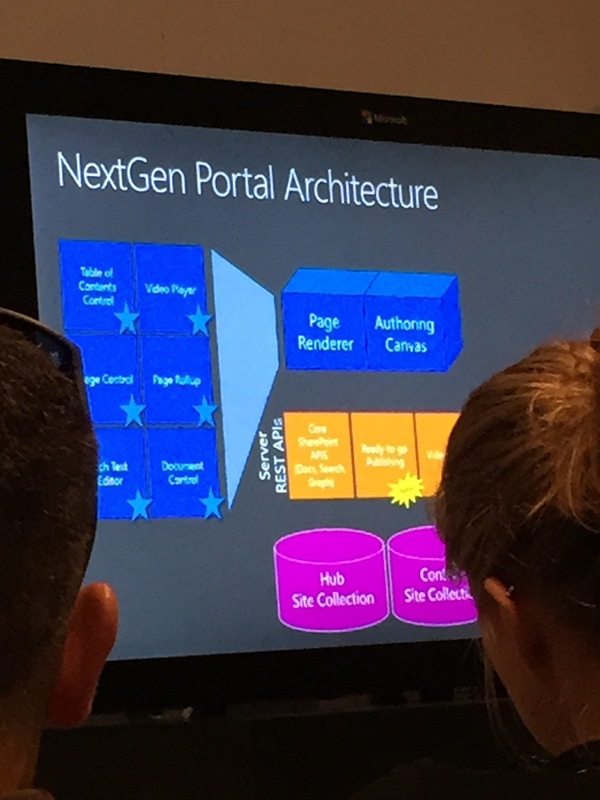 Potato picture of the NextGen portal architecture. 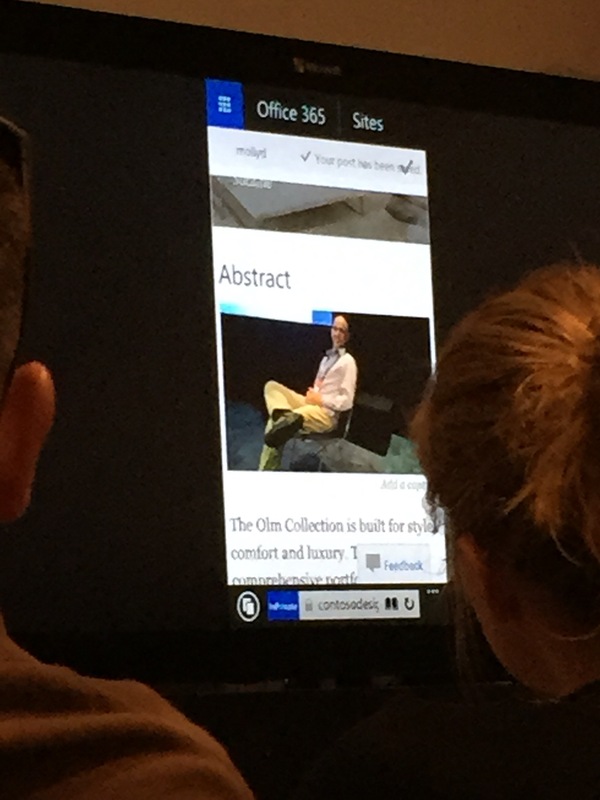 Microsoft just rolled out the Office 365 Video Portal, which, according to the deep dive session, combines Azure Media Services, a traditional SharePoint site collection-based information architecture, and the power of the Office Graph to deliver video content wrapped in beautiful responsive design. There are two ways that we we create content for portals: from the top-down, and from the bottom-up. MicroSites are Microsoft’s answer to the top-down approach, and will essentially replace Publishing sites as the means of publishing curated content, called “Articles”, in canned layouts with images, live document previews (you can even choose to display a specific page of a document!) and WYSIWYG editors. 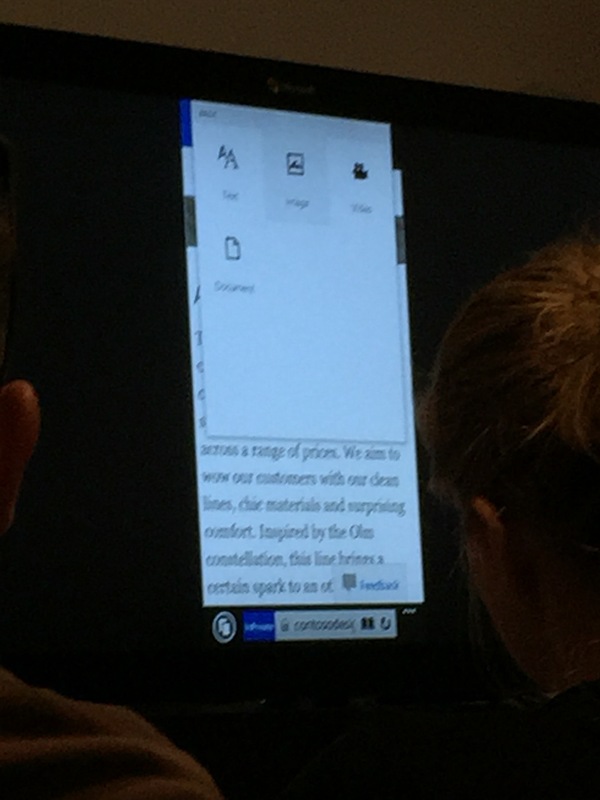 Here to stay is a contextual WYSIWYG text formatting menu (displayed on right-click) and– you might want to sit down for this one– automatic saving of drafts! Microsoft’s goal here is to make creating and editing beautiful articles seamless and consistent, so they make a lot of design decisions for you. 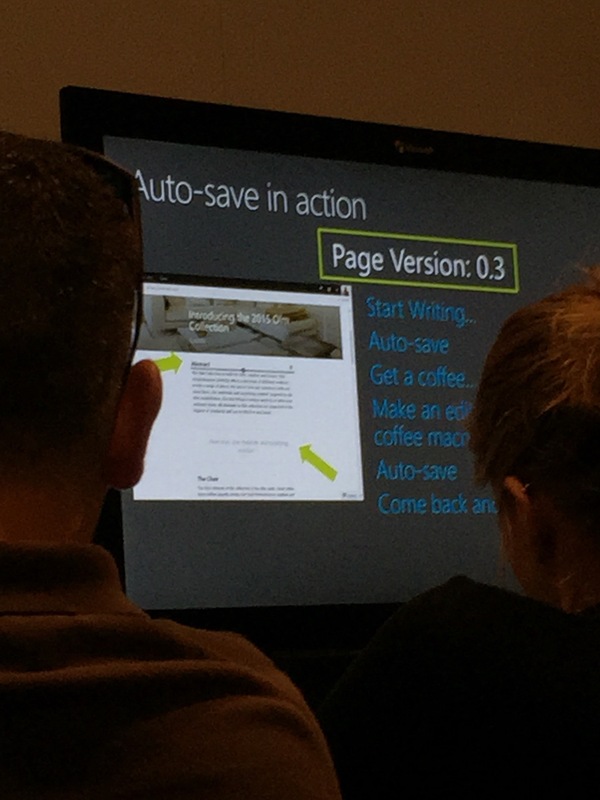 But the trade-off is that your Article is responsive, beautiful and functional out-of-the-box. In addition to “top-down” curated content, organizations also contribute information to portals from the “bottom-up”, meaning we aggregate less-governed content that users create and use as part of their daily work. Both of these concepts– top-down and bottom-up– are central to Microsoft’s new vision for Knowledge Management portals, which essentially combine MicroSites (see above) and Boards (like in Delve) to create a responsive, aggregated view of curated content for users. Because it’s not released yet, details were pretty skimpy on what Microsoft is calling the “Infopedia” portal, but know this: portals in Office 365 aren’t dead, and Microsoft is taking them seriously. SharePoint 2016 is coming, but it’s a second-class citizen now. Delve, Video Portals and the Office Graph won’t be available on-prem EVER because they rely on machine learning only attainable in the cloud (although there will be hybridization opportunities in the future). The jury is still out on whether any of the Next-Gen portals (in all their responsive design glory) will make it to the next on-prem version of SharePoint. We built Office 365 by porting SharePoint 2013 to the cloud, then continued to expand the featureset. SharePoint 2016 is the first version of SharePoint where we are taking innovations we already made in the cloud, and are bringing some of them on-premise. Microsoft is applying knowledge gained from scaling SharePoint Online to the bones of SharePoint 2016 by porting the SharePoint Online featureset– at a given point in time– to the on-prem server. Exciting, huh? Maybe, if you don’t consider the fact that all of these features have been available in Office 365 (or were necessary to support it) for some time now. Hybrid is the new on-prem. Bingo. So if you want to bring your SharePoint environment into the next generation, you’re going to need the cloud to get you there.